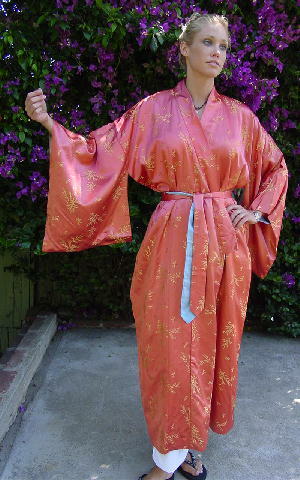 This vintage poly blend kimono was made in Japan. 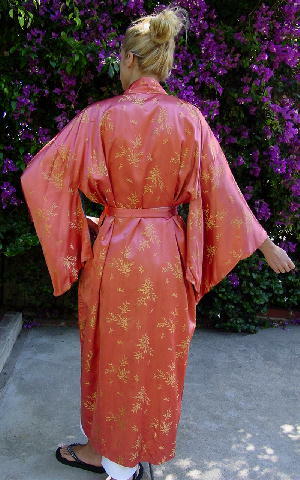 The exterior is in a peachy-coral and has golden flecks. 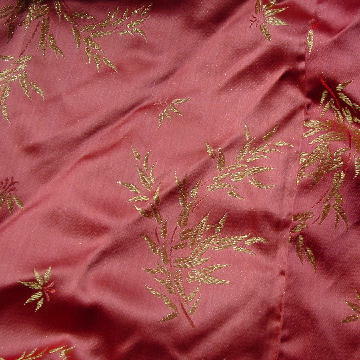 It has a bamboo leaf pattern in gold metallic thread and stems in a tone-on-tone orange-red color. 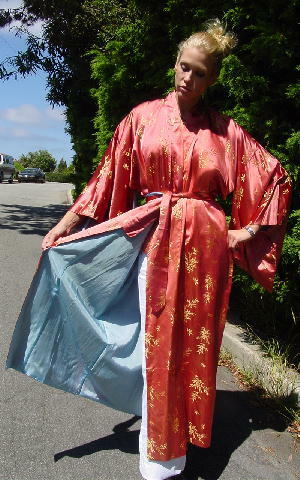 The lining is in a light blue synthetic fabric. The sleeves are 13 3/4" wide by 18 5/8" high and have 8 3/8" end openings. The fabric (and lining) matching belt is 68" long by 2 1/4" wide and has pointed ends. There is a 2 1/8" extended collar, and the front sides overlap (8 1/4" overlap, measured 14" down from the armhole ends). It will fit a size small to a size extra large. neckline to end of sleeve 24"
shoulder to hem 53 1/2"